Marines are a type of terran soldier. "Work hard, play hard, die young... but not today!" Regarded as foundational units, marines compose the bulk of most terran front-line forces, ranging from officially government-sanctioned units, local militias, and private security firms, to pirates, renegades and mercenaries. Koprulu sector marines are generally equipped with powered armor suits and rapid-fire C-14 rifles. The suit provides full life-support and NBC protection, allowing marines to deploy into environments that would otherwise be inimical to human life. Massed marines form a flexible and highly effective fighting force for both offensive and defensive operations against both ground and air targets. Despite such material investment into each marine, they tend to have extremely short combat lives, the expectancy being mere seconds. To improve their effectiveness and odds of survival, many marines make heavy use of stimpacks. "Marines are the first line of defense for the terran worlds of the sector. Comprised of convicts, rebels and patriots alike, they're always ready for a fight." "The Marines? The Marines are the biggest collection of criminals outside of the Tarsonis City Council!" A significant proportion of the Confederate Marine Corps was manned by "culturally challenged" individuals who had undergone neural resocialization via brain surgery, implants such as aggression inhibitors, and resocialization tanks. Counseling and drug therapy were also used to help overcome criminal and/or anti-social tendencies. Despite this source of manpower, it was not always sufficient to replace battlefield losses, and instances of law-abiding persons being conscripted and subjected to "resoc" were not unknown. In any case, volunteers were few. Some marines had barcodes tattooed or branded onto their foreheads. By the time of the protoss attack on Chau Sara, each Confederate marine was officially issued a CMC-300/CMC-400 combat suit and a C-14 rifle. The slugthrower was a common sidearm. Confederate marines did not require a PEB (Preferred Experience Base) to enlist (or be conscripted as the case often was). "A marine's work is not all fun and games. He has a duty as well...and that duty is to every world in the Terran Dominion, no matter how small." The fall of the Confederacy and its replacement by the Dominion (the Confederate Marine Corps being replaced by the Dominion Marine Corps respectively) has seen an increase in volunteer recruitment, but not enough to supplant "resoc" conscription. Marines continue to use variants of the C-14 rifle many years after the Brood War, along with the inclusion of M98 ballistic alloy combat shields in their arsenal. At some point, the slugthrower was replaced by the more powerful flak pistol. Recruits and conscripts considered too scrawny or weak for the Marine Corps were given steroid and stimulant treatments in order to increase their muscle mass. Criminal recruits were given no R&R time. After the Brood War, the Dominion developed a modified Quantradyne APOD-33 dropship, the medivac dropship, to increase the survivability of medics and keep marines in the field longer. The success of the medivac design led to their adoption by the other Koprulu terran factions, though medics are still fielded due to the medivac being expensive to deploy. The Dominion Special Forces also keep a large cadre of marines with specialist equipment, and while they do not serve long those marines agree there is never a dull moment. Specialist marines with advanced technology were given to Nova Terra's Covert Ops Crew during the Defenders of Man Insurgency. Dominion marines continued to be the first line of defense to the terran nations and groups of the sector well after the End War. During the reign of Emperor Valerian Mengsk, the practice of resocialization was outlawed among the Dominion Marine Corps. Marines at the time were known to also make use of the CMC-400 powered combat suit. UED marines, known as "smiths," bore similar-looking equipment to the same standards as their colonial counterparts, and were supported by elite combat medics in their tactical units. The improved survivability of UED marines inspired Koprulu terran forces to adopt medics in a similar fashion. Their armor was an advanced CMC-400A Powered Combat Suit, which contained advanced power cells, a heavy outer and inner shell, and an onboard artificial intelligence named the CMC 5000 "HAITE" System. At least some marines among the UED Expeditionary Fleet were controlled through aggression inhibitors. Instead of the C-14 gauss rifle, they are equipped with the C-141 AC Gauss Rifle, the C-150 Ronin pistol serving as a sidearm. The Kel-Morian Combine was fielding marines by the Brood War, as opposed to more irregular units during the Guild Wars. The Umojan Protectorate marines are equipped with their own type of armor, as opposed to the standard CMC designs of past years. Other organizations such as mercenary and rebel units have made use of marines. These include the Sons of Korhal, Raynor's Raiders, the War Pigs, the Moebius Foundation, Mira's Mercs, and the Mar Sara Separatists. Mercenary marines often carry bladed rifles, largely for intimidation and use in backwater bar fights. The Alliance Marine Corps appears to be a relatively small force, free of practices such as neural resocialization. The C-14 rifle is the standard issue weapon for Alliance marines, though the E-9 rifle and C-7 pistol are also in their arsenal. For StarCraft gameplay information see: Marine (StarCraft). For StarCraft in-game quotations see: StarCraft I Marine Quotations. Many changes were made to units and structures throughout the StarCraft alpha and beta and the marine was no exception. In the early beta, marines were known as marauders. By mid-beta, the title of the marauder had changed to Terran Space Marine mk 2, possibly as a reference to (or derived from) the Space Marines of Games Workshop's Warhammer 40K series. The term marauder was resurrected for a StarCraft II unit. 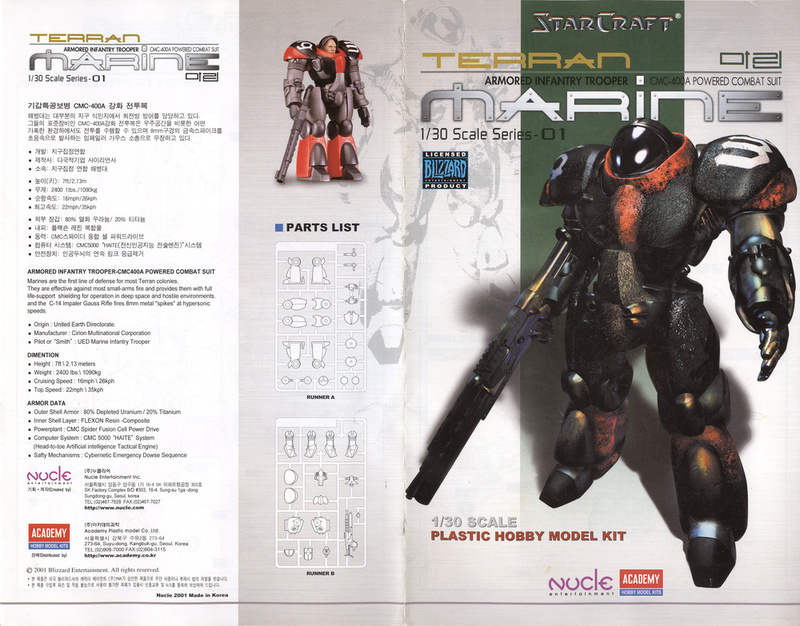 By late beta, the marine bore great resemblance to its current version. However, they were stated to possess a pressurized power suit and chain-gun cannons instead of the CMC Powered Combat Suit and C-14 rifle, respectively. In addition, they were stated to possess gravity boots. In-game, marines behave similarly to the marines from Aliens, even quoting lines from the film. One of these is "How do I get out of this chickenshit outfit?". The marine in StarCraft: Ghost is a heavily armored, slowly moving unit, compared to the more lightly-equipped light infantry unit. Marines carry powerful gauss rifles that may be equipped with grenade launchers. The marines can also carry flak pistols that inflict area-of-effect damage. In the Invasion Mode, light infantry could "upgrade" into a marine at a cost of two points. For StarCraft II gameplay information see: Marine (StarCraft II). For StarCraft II in-game quotations see: StarCraft II Marine Quotations. The following section contains information from the Warcraft series and is not canon. Marines appeared in Warcraft III as a map-editor unit. Marines appeared in early builds of Heroes of the Storm. They currently appear as ranged minions in Braxis Holdout and Warhead Junction. Marines make a cameo appearance in the Blizzard game Overwatch, on the arcade machines named Siege Mode 3. Marine action figures and cups can be found scattered around in the Blizzard World map in Overwatch. When shot, the action figures give the marine death sound. A marine scale 1/30 model is available from Nucle Entertainment and ACADEMY Hobby Model Kits. A marine bottle cap figure is available from Kotobukiya. Two StarCraft marine figures were available, one with blue armor and one modeled after the red marine from the race selection screen. The noobz line of toys sold at BlizzCon 2009 were based on the model of the marine. A set of marine plastic "army men" were sold on the Battle.net store, and are still available on Amazon. Marine toddler shirts and onesies are sold on the Battle.net store. ↑ 2.0 2.1 2.2 2.3 Underwood, Peter, Bill Roper, Chris Metzen and Jeffrey Vaughn. StarCraft (Manual). Irvine, Calif.: Blizzard Entertainment, 1998. ↑ 3.0 3.1 3.2 Barba, Rick. StarCraft Field Manual (hardcover). Insight Editions, November 17, 2015. ↑ 4.0 4.1 Medic. Blizzard Entertainment. Accessed 2007-09-03. "While expendable, the massive losses of terran Marines during the Great War began to become cost prohibitive. The Medic's use of chemical modifiers has greatly enhanced the survival rate of UED forces, lengthening the expected battlefield life expectancy to over nine seconds." ↑ 5.0 5.1 Hickman, Tracy (May 21, 2002). StarCraft: Speed of Darkness. Simon & Schuster (Pocket Star). ISBN 978-0671-04150-2. ↑ 7.0 7.1 Grubb, Jeff (February 27, 2001). StarCraft: Liberty's Crusade. Simon & Schuster (Pocket Star). ISBN 978-0671-04148-9. ↑ Marine. Blizzard Entertainment. Accessed 2007-09-03. ↑ 11.0 11.1 2005-05-25. Marine. Blizzard Entertainment. Accessed 2007-09-06. ↑ Waugh, James. "A War On." (Feb. 13, 2013). Blizzard Entertainment. StarCraft Lore: A War On Accessed 2013-02-13. ↑ Blizzard Entertainment Staff. 2010-07-24. Medivac. Blizzard Entertainment. Accessed 2010-07-24. ↑ Blizzard Entertainment. StarCraft II. (Activision Blizzard). PC. Mission: Nova Covert Ops, Enemy Intelligence (in English). 2016-03-29. ↑ Blizzard Entertainment. StarCraft: Brood War. Vivendi Games. Mission: Patriot's Blood (in English). 1998. ↑ Blizzard Trivia. Gissar's Scratch Pad. Accessed 2007-10-27. ↑ Blizzard Entertainment. StarCraft: Brood War. Vivendi Games. Mission: The Kel-Morian Combine (in English). 1998. ↑ Blizzard Entertainment. StarCraft II: Heart of the Swarm. (Activision Blizzard). PC. Cinematic: Hopes and Fears (in English). 2013-03-12. ↑ Blizzard Entertainment. StarCraft II: Heart of the Swarm. (Activision Blizzard). PC. Cinematic: Choices (in English). 2013-03-12. ↑ Benjamin, Paul and Dave Shramek (w), Mel joy San Juan (p), Noel Rodriguez et al (i). "Orientation." In StarCraft: Frontline: Volume 4 (paperback binding), pp. 114-161. Tokyopop, October 1, 2009. ISBN 978-1427-81698-6. ↑ StarCraft. Vivendi Games. Mission: Precursor bonus campaign, mission 1: "Strongarm" (in English). 1998-09-03. Map Archives: Precursor Campaign. ↑ Blizzard Entertainment. StarCraft II: Wings of Liberty. (Activision Blizzard). PC. Stetmann's zerg research log (in English). 2010. ↑ Bill Slavicsek, David Eckelberry, Shawn F. Carnes. Alternity: StarCraft Edition. Wizards of the Coast, March 1, 2000. ISBN 0-7869-1618-4. ↑ Karune. 2008-01-25. StarCraft II Q&A - Batch 27: Gameplay Series. Battle.net StarCraft II General Discussion Forum. Accessed 2008-01-25. ↑ 35.0 35.1 Park, Andrew. 2005-10-28. Starcraft: Ghost Updated Multiplayer Hands-On - Zerg Rush! Gamespot. Accessed 2008-11-09. ↑ Source: BlizzCon 2005 StarCraft: Ghost information. Terran Infantry. Artist: Blizzard Entertainment. Accessed 2007-09-08. ↑ Blizzard Entertainment. Goody Bag Information: Raynor Noob. Blizzard Entertainment. Accessed 2009-08-21.